Back row, left to right: R Orton, M Bonsor, F Clarke, A Hutchinson, H Waite, S Hallam, W Machin. The early years of the Quorn Cricket Club revive memories of those distant Victorian days when there were private cricket grounds on a number of estates in the district. At that time Quorn played several matches at country houses, which included Quorn House, Quorn Lodge, Stanford Hall and other well-known places. The bounteous hospitality and genial good fellowship associated with these fixtures are vividly recalled by old cricketers in the village. The humorous side of cricket was then more pronounced, and there were several old-fashioned enthusiasts in Quorn who unconsciously lent a humorous touch to the proceedings. The most famous of these characters was old Jimmy Rumsby, an ardent supporter of the club. He was for many years landlord of the White Hart, which for over half of century has been the headquarters of the cricket club, and was a familiar figure in his large top hat, high choker collar, and long frock coat. One of his sons, William Rumsby, was a very fine cricketer, and on a memorable occasion, when W G Grace played at the Athletic Ground at Loughborough, he had the distinction of ending the great man's innings by holding a "hot-un" at short leg. Jimmy Rumsby was very proud of his son, a fact of which certain enterprising people were wont to take undue advantage. When young Rumsby was at the wicket they would station themselves near to the old man and make loud and complimentary allusions to the batsman's skill. They would turn to old Jimmy and courteously inquire the name of that prolific rungetter. The answer seldom varied. "This is my son, sir, come and have a drink." He would lead them to the conveniently situated adjacent White Hart, and the cricket ground would see them no more. 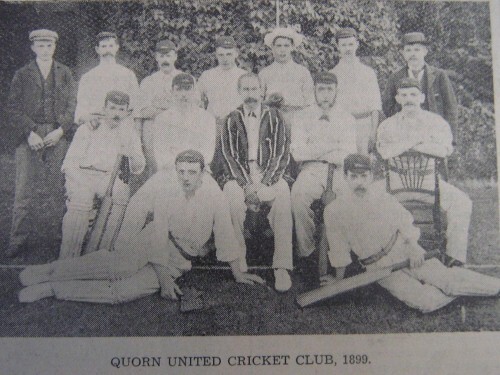 As early as 1872 this Quorn Club was in a flourishing condition, and played on the field on Leicester Road which has now been converted into "The Park". Some years later it appears to have been disbanded, but was revived in the eighties, and in 1889 this second club was in existence, and played in the paddock at Quorn Hall. At that time the kennels were close at hand, and the cricket ground was also used as an exercising ground for the hounds, a practise which often considerably interfered with the activities of the team. In 1891 the committee were held in a room belonging to the Wesleyan Chapel, and presumably for this reason, the name of the club was altered to Quorn Wesleyans. About this time Jimmy Rumsby, one of the third generation of that famous cricketing family was elected captain. The club had now moved to a ground in Love Lane field on the Barrow Road, part of which has recently been used as a building site. This field was lent them by Mr John Darker on exceedingly generous terms. No rent was charged, but a stipulation was made that the ground should be kept in good order and the nettles under control. For different reasons the club was compelled to make several changes of ground in the next few years, and it is a tribute to the enthusiasm of its members that in spite of these serious difficulties it continued to flourish. The Apple Tree field, where Mansfield Street now stands, was their next home, but unfortunately this was not available for more than one season, and after a frenzied search they were able to obtain the use of the Stafford Orchard. They were on this ground in 1893, which apparently was a very dry summer, and the watering of the pitch became a problem of grave difficulty. On one occasion the services of the local fire brigade were urgently sought, and on a Friday evening, the night before an important match, the ever willing firemen hastened to answer this unusual call. It was not long before further changes were necessary, the club being transferred to a field on the Chaveney estate, and in the following year to the Dustmore field on the Leicester Road, immediately opposite to One Ash. It was in 1897 that the club acquired Cave's field, where they have contrived to remain for a period of 37 years, often on the hazardous terms of a yearly tenancy. For several seasons Mr J A Le M Hayward was captain of the team. He had a natural aptitude for most ball games, and was a very fine shot. During the Zeppelin raid early in 1916 he made a patriotic effort to bring down one of the German airships with a sporting gun, but unhappily this "large bird" eluded his aim. There is a tablet on the south wall of Quorn Church to the memory of John William Davis, who was killed in the Boer War. He was a prominent member of the cricket club, a fine wicket-keeper, and a very fast scorer. He was responsible for one of the biggest hits ever made on the ground. The ball pitched into a hollow, where a pump once stood, about 30 years beyond the footpath leading from Chaveney Road to the main Leicester turnpike. His photograph is seen in the accompanying group. This was kindly lent to us by Mr Herbert Waite, one of the fastest and most successful bowlers who has ever represented the club. In the nineties A D Pougher, the Leicestershire professional, accomplished a remarkable performance in a county match when he took five wickets for no runs. This memorable feat apparently inspired one of the Quorn eleven, Mr "Matt" Bonsor, for in a league match shortly afterwards he returned the same remarkable bowling analysis, a highly creditable effort, although in a humbler sphere. Another member of the team at that time was Mr Sam Hallam, who for 50 years, in various capacities, has rendered faithful services to the club. The teams in the North Leicestershire League in the years immediately preceding the war were exceedingly strong, and during this period some well-known players were seen in the ranks of the Quorn club. Mr Harold Wright, a fine left-hand bat and bowler, captained the team for a few years, and later, for a short time, had the distinction of leading the county side. Mr C K White, the eldest son of the late Mr George White, was also a very good all-rounder, and an invaluable member of the eleven until he joined the Loughborough Town team. These two fine Quorn sportsmen both lost their lives in the war. The Quorn Club was successful in winning the Loughborough Charity Cup in two successive years, 1911 and 1912, and in 1914 they continued their run of success by carrying off the league championship. In 1913 Mr J Gamble was elected captain of the team, a position he held until 1926, when he was succeeded by the present skipper, Mr D H Bream. One of his brothers, Mr Frank Bream, has been secretary for four years, while a cousin, Capt. J W Bream, a famous old Tiger, is a useful member of the side. Last year the club was successful in winning the Sileby Cup, in which most of the rounds were played at night. In one of these matches Mr K Hopwell distinguished himself by a "marathon" innings of 72, which lasted for two entire evenings. About a year ago, in a league match, Mr Douglas Bream played a magnificent innings of 115, one of the largest scores which has ever been made for the club. An interesting and treasured bat in his possession was presented two or three years ago by Mr F A Toon to the player with the highest average for the season. This was autographed by all the members of the English and Australian test match teams, and was used during the last tour in Australia by Herbert Sutcliffe. The difficulty experienced in the past in obtaining a convenient and permanent ground has already been referred to. Thanks to the generosity of the late Mr George Farnham this uncertainty is now removed. In 1928 Mr Farnham bought Cave's field, and handed it over to the trustees of the Rawlins Charity with the proviso that the Cricket Club was to have the use of it as long as they desired. Mrs William Farnham, who has been in residence at Quorn House for nearly a year, maintains the interest in the welfare of the Quorn Club which this old Quorn family has always shown, an association which is greatly valued by the members. The problems of the ground having been solved, the committee began to devote their attention to the question of improved accommodation. There were in the fortunate position of having a sum of £75 in hand, which was supplemented by an exceedingly generous gift from Mr J A Hartopp, always a good friend to the club. It was therefore found possible in 1928 to erect a new pavilion at a cost of £160. In 1933, with admirable enterprise, the levelling and general improvement of the ground was undertaken, the necessary amount of £37 10s being raised chiefly by whist drives. The club has undergone many changes of fortune during the last 50 years, but having at last a fine ground of their own, and excellent quarters, they can look forward to the future with every confidence.